Throwing Shade Theatre Company proves that you don't need all the bells and whistles to present theatre. All you need is a play with a strong script, intelligent dialogue and compelling characters. After the success of Down an Alley Filled With Cats, earlier this year, this independent stage troupe returns with another re-awakened classic of absurdist theatre, The Caretaker by Harold Pinter. Absurd comedy/drama can be an acquired taste, but Pinter is one of the greats and The Caretaker, originally produced in 1959, stands the test of time, almost ten years after the playwright's passing. 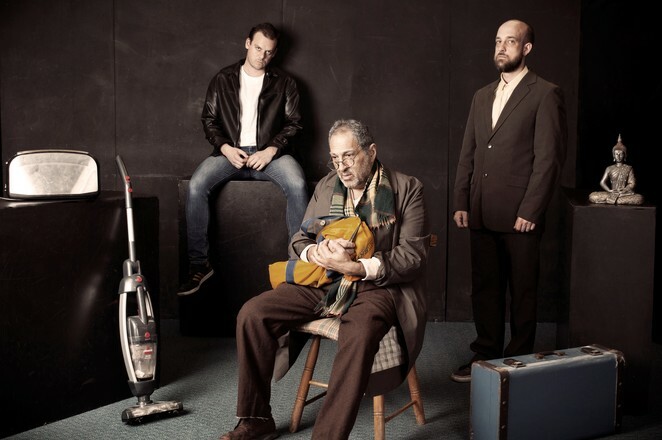 More recently, the term absurd has been replaced with the characterisation "comedy of menace" and for me, there is no better way of describing the atmosphere conveyed by this new production, played in the most intimate of settings at The Actors Pulse in Redfern. The Caretaker is a one-setting, three-man play, with minimal lighting and sound effects. The audience in the front row is, at times, only centimetres away from the action on stage; the recreation of a small, crowded bedroom in an almost derelict building. This enclosed space is home to the full scope of drama in the two-hour performance, but don't let this deter you. The Caretaker is one of those character and dialogue-centric plays that just works. It is bound to keep the audience enthralled, provided it is handled with the care and respect it deserves. The storyline is based on the coming together of the kind but introverted Aston, who opens his small bedsit to a pretentious tramp (Davies), whose past is mysterious and chequered. Seemingly out of nowhere, Aston's bully-boy brother turns up, threatening to expose the tramp but somehow all three wind up co-existing. They invent a web of pipe dreams about doing up the derelict building and 'making a go of it'. 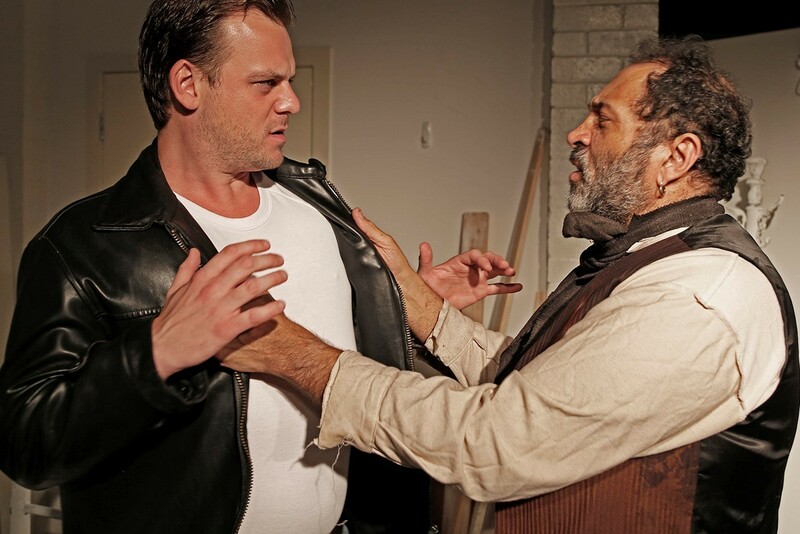 Throughout the play, the slow-moving action is driven by spellbinding dialogue and characters you will love to hate. What will come of the building dramatic tension? Will the malice behind the character's words, be the unlikely trio's undoing? Fortunately, Throwing Shade Theatre Company and its Director, Courtney Powell, have taken an intelligent and measured approach to Pinter's work and the result is a triumph of independent theatre, well-suited to its quirky, no-frills venue. Powell and Producer Andrew Langcake, have assembled a fine cast of character actors, including Langcake himself, as the enigmatic Aston, stage & screen veteran Nicholas Papademetriou , as the infuriating 'bum' Davies and seasoned performer Alex Bryant-Smith, as tough geezer and comically menacing, Mick. Powell makes a point in the program's Director's Note, that Pinter's strength is his blending of humour and pathos. If a director steers his/her production too far in either direction, they will subvert the impact of the play. Powell does an excellent job in keeping the balance right, with actors that understand comic timing but also the dramatic sadness underlying the character's banter. Aston, Davies and Mick are essentially hopeless cases, each doomed by their inability to find a true connection or satisfying means of communication, with each other. I enjoyed the play immensely, although 'enjoyed' may be a strange word for such an experience. It was a 'close' performance which felt like I was living in the cramped bedsit with a bedraggled, dirty tramp, a broken man with seemingly endless patience, and a belligerent brother who just might blow his top, at any moment. Having said this, I never felt 'uncomfortable' in the intimacy of the space. I felt challenged and infuriated but consistently enraptured by the dialogue, black comedy and suspense, and rewarded by the brilliant performances of the cast. If you're a fan of intelligent theatre and playwright pedigree, don't miss the final week of nightly performances of The Caretaker. What Throwing Shade Theatre Company lacks in pretension, it makes up for in its knack for re-enlivening classics of the stage. Its productions are based on intensity of character and dialogue, rather than the smoke and mirrors of special effects. I laughed out loud at the outlandish humour in much of the dialogue in the (sometimes) ridiculous banter between these three very different characters; all of whom were totally obsessed with themselves. At other times I was deeply engaged with the issues, just as relative today as when they were written. I really loved this rivetting interaction between three real "gunnas"; all going nowhere fast!